I’ve written before about the challenge of Getting Things Done. I’m often writing about it, because I’m often trying to get better at it! Those of you that have read, or tried to read, David Allen‘s book will know the feeling that comes when your mind begins working too hard to keep track of the things you’ve agreed to do. This year, I want to get better at being mindful, and an important part of that is feeling like I’ve implemented the GTD system better. I’d say I’m pretty good at getting to Inbox 0, and generally processing things but I’m not great at delegating or renegotiating things that find their way onto my list and keeping them current. After a time, I stop trusting the lists because they cease representing an accurate and current account of what I need to do. So, it’s with this in mind that I sat down today to figure out some simple questions I can ask myself every week to better keep my system up to scratch. 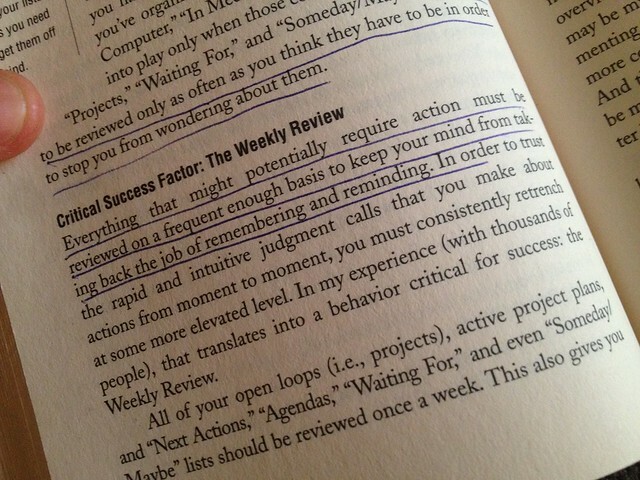 Essentially, how to do a weekly review. Gather everything from your inboxes (email(s), calendar, yammer, letters). Put them where they belong in your the relevant lists. Am I clear about what’s happening this week? What have I previously agreed to make happen this week? What’s in my calendar? Is everything ready for those events? Is my system clean? Am I stuck with anything that I’m not sure where to put? Is my next action list current? Is there anything on this list that is old or needs renegotiating? Is it complete? Is there anything that’s not in the system that should be? I’ve never nailed the weekly review, so will see if this helps me at all. How do you do your weekly review? Anything I’ve missed?